Direct connection Berlin Hbf - Fürstenberg (Havel) 58 Minutes. Every hour from Berlin. Further with the bus Fürstenberg (Havel) - Lychen. We can pick you up from Lychen markt for free, it is also possible to pick you up from the trainstation Fürstenberg. You can bike the 15 km from the trainstation Fürstenberg to Rutenberg along beautiful bikepath. 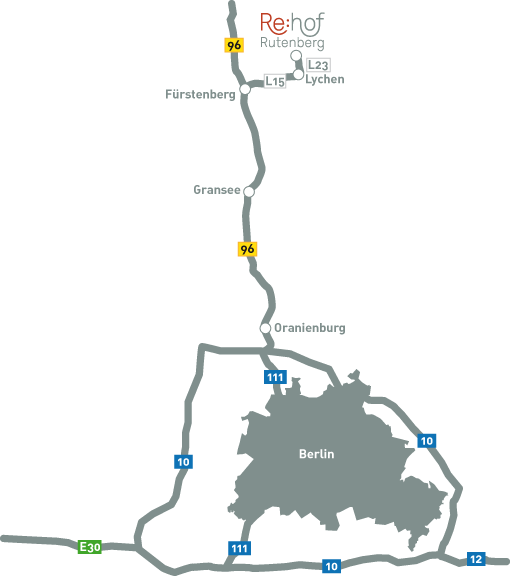 From Berlin you take the B96 to Fürstenberg a.d. Havel, then turn from Fürstenberg direction Lychen. In the centre of Lychen you turn left and follow the main road. Then follow the signs to Feldberg and Beenz. Between Lychen and Beenz you turn left to Rutenberg. Re:hof Rutenberg is situated directly behind the church.